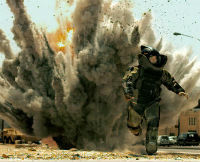 Voltage Pictures, the makers of The Hurt Locker, have voluntarily dismissed around 90% of the defendants from their record-breaking lawsuit against alleged file-sharers. More than 2,300 Does remain in the suit and are currently unidentified, but several others have now been named. Read on to find out which IP addresses remain in, which are out, and who has been named. Working alongside Dunlap, Grubb and Weaver law firm (better known as the U.S. Copyright Group), Voltage Pictures have been in the headlines time and again this year. Not for their movie-making skills, but for the copyright settlement shakedown built around their products. Their most successful movie, the Oscar-winning The Hurt Locker, attracted much of the attention when earlier this year it became the subject of a record-breaking lawsuit. According to court documents filed this week, Voltage Pictures have voluntarily dismissed around 90% of the original 24,583 Doe Defendants from The Hurt Locker lawsuit. They were dismissed without prejudice, so in theory they could be filed again at a later date. A full list of the IP addresses dismissed from the case can be found embedded below. In excess of 2,300 potential Does remain in the suit from a range of ISPs including Atlantic Broadband, Bresnan Communications, Charter, Comcast, Mediacom, Midcontinent Media, Qwest, RCN, Sprint, Verizon and Windstream. Furthermore, according to the documents Voltage have homed in on a number of now-named defendants; Claudio Vazquez, Modern Classics Inc, Sergio Sapaj, Roy McLeese, Kelechi Lane, Shyam Madhavan, Susan Glass, Daniel Bremer-Wirtig, Michael Sein, Elena Ditraglia, .. and J Barry Harrelson. Defendants Vazquez, McLeese, and … were dismissed, Glass was served and has filed an answer, Harrelson was served and is yet to file a response. Defendants Lane and Modern Classics have been served but have not responded – Voltage are going for a default judgments against these. Voltage say they have been unable to serve some of the other named defendants above, and have not yet received identifying information for 2,278 IP addresses, mainly due to ISPs stalling due to “motions purportedly filed by the Doe Defendants.” For this reason they request extra time from the court. “Plaintiff requests at least an additional 60 days in which to effectuate service on Defendants Bremer-Wirtig, Ditraglia, Madhavan, Sapaj, and Sein and to name and serve, or voluntarily dismiss without prejudice, the remaining Doe Defendants,” the court papers read. How many of the original 24,583 defendants settled with Voltage Pictures for thousands of dollars remains unknown. c There are 41 comments. Add yours?